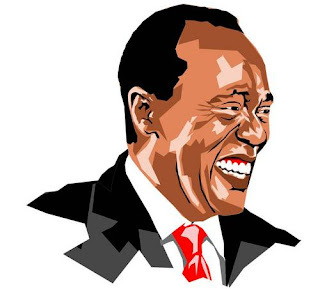 Jeff Koinange Dissed By Star Newspaper For being Openly Anti-Raila. Jeff Koinange is the undisputed talk show king in the region. Very few would actually match his prowess in Africa. For this he has been at the centre of various entertainment shows, including Keff Joinange of XYZ show (voice done by Nick Odhiambo), and some unsuccessful attempts to mimic his voice by various acts on Churchill live. His show capital talk, has often been termed as the backbone of K24, in rather harsh words, people do not watch K24, they watch Capital talk. Jeff has been able to bring the high and mighty on the show. Starting with our very own elite, to the presidents of Uganda, South Sudan and Rwanda, to the very known Moreno Ocampo. His style of interviewing has made some of this faces return guests. On the Star newspaper issue of Saturday, 4th feb, Jeff koinange is under attack. He has been branded as a ‘man on a mission’. The newspaper has beef with his style of interviewing Miguna Miguna. It does not escape the paper’s attention that Miguna has become a regular at the show ever since he fell out with Raila Odinga. This was not the case when the two were tight. According to the star, Koinange, in his interviews, constantly leads Miguna into accusing Raila of influencing the ICC trials of Uhuru and Ruto. ( Uhuru is also reported to have majority control over K24) When Miguna gives answers, that Koinange terms as inadequate to make Kenyans believe that Raila was responsible, Jeff presses harder and harder often with questions meant to lead to obvious answers, eg. were you working alone or were you on assignment. The star even gives a few comments that followed the clip of the interview with Miguna on youtube. Some termed it unprofessional, while others called it gossip. Jeff and uhuru are known to be buddies and the latter has even appeared on Capital talk. The media should nevertheless be very impartial and Jeff should dispel claims of bias against the Prime minister by doing the most honourable thing, hosting Raila on Capital Talk. Njenga Karume is Not Dead.